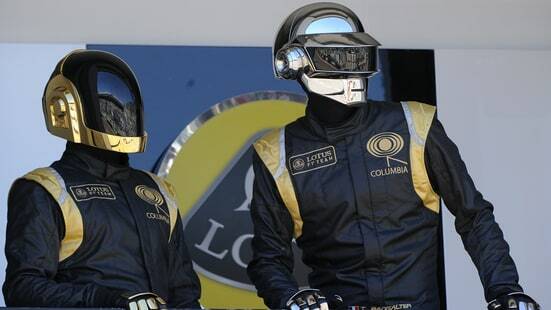 The robots revealed their true identities Friday night at Daft Punk&apos;s launch party for their Los Angeles pop-up shop. The store, located at luxury boutique Maxfield, served as a prelude to their Grammy Awards performance this Sunday, where the French duo, consisting of Thomas Bangalter and Guy-Manuel de Homem-Christo, were in attendance wearing helmet-free civilian attire. The pop-up shop, which opens to the public on Saturday until Feb. 19th, celebrates all things Daft Punk, with rare memorabilia housed beneath glass cases. The roulette wheel photographed for the cover art for "So Much Love to Give" and the single from Bangalter&apos;s previous group Together were on display alongside the transparent drum kit and bass guitar used in videos for 2013&apos;s Random Access Memories, full-sized mannequins wearing Daft Punk&apos;s futuristic body suits from throughout their career and a long table consisting of proofs of photos taken on several tours. The shop itself remained hectic, as patrons purchased items throughout the four-hour event. Drinks were served and a food truck was on hand in an outdoor space, where Homem-Christo spent much of the night conversing with partygoers in a black suit and brown dress shoes, his face consumed by an oversized pair of sunglasses. Bangalter, similarly clad in a black suit over a black T-shirt, spent much of the evening inside, where patrons including Elijah Wood and Travis Barker waited on line to buy merchandise. It was a lightly star-studded event — Ciara and Russell Wilson stopped by to snap pics of the Daft Punk mannequins before leaving early, while the Weeknd made a brief cameo — though the party was mostly filled with industry types and VIPs who helped themselves to the spread of T-shirts, mugs, full body suits, studded jackets and hats, most of which is available on the pair&apos;s website. But what made the merchandise particularly special was the limited edition items created by Gosha Rubchinskiy, Off-White, Hervet Manufacturier, Darkdron, Enfants Riches Deprimes and Han Cholo. Electronic DJ and Skrillex associate Mija held down music duties behind the turntables for the bulk of the party, right up until Skrillex stopped by for a surprise, hour-long DJ set. While Mija stuck to a more electronic palette tailored to the men of honor, Skrillex weaved together 2 Live Crew&apos;s "Me So Horny," Drake&apos;s "Fake Love" and Kris Kross&apos; "Jump" as partygoers crowded the DJ booth, phones in hand.